The banks of seaweed and their particular smell of iodine can be felt and seen on the seashore after stormy days. 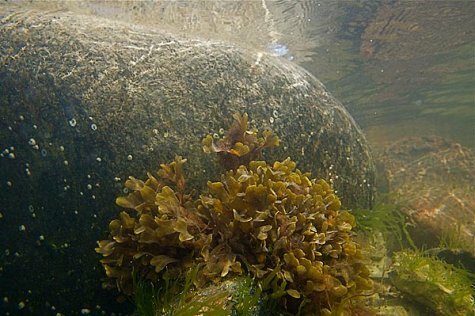 The bladder wrack is a perennial brown alga and its preferred habitat is rather stony and hard-bottomed seabeds. In the shore area it grows already at a depth of some tens of centimetres and down to a depth of four-five metres. It is attached to the bottom by a disc and looks like a shrub with flat shoots or fronds, with a height of about half a metre. The colour is brownish green, sometimes quite dark; the colour can vary quite widely. The name bladder wrack comes from the bladders or vesicles that keep the alga floating upright in the water – always towards light and sun. Reproduction may be interesting too: it becomes sexually mature at about three years of age; until that time the male and female sexual organs develop. In June-July the gametes ripen and in late winter-early spring a new alga already begins its development. The bladder wrack has become noticeably less common due to the eutrophication of our sea waters: the transparency of the water has decreased; a hundred years ago the alga still grew at a depth of twelve metres. Also, the faster growing filamentous green algae stifle the habitats of the bladder wrack. Seaweeds were a highly valued fertiliser for people on the coasts earlier and even now seaweeds can be composted and spread out under apple trees and berry bushes or used to boost flower beds. Seaweeds contain plenty of potassium, phosphorus and minerals. 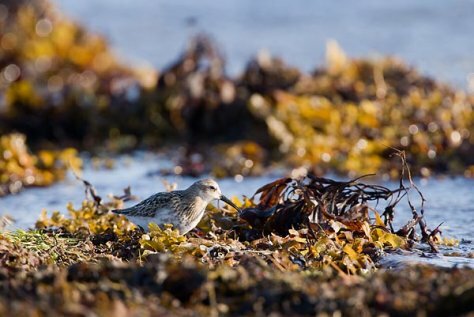 On freshly stranded sea matter we can nearly always see birds.